Rip and Inject your sound effects CDs with Broadcast Wave metadata. 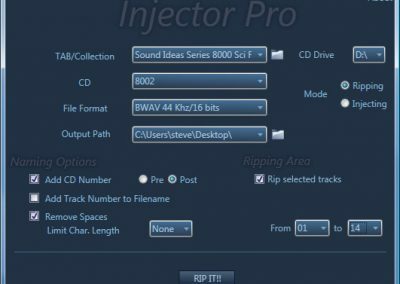 The program is great for people that ripped their Sound Ideas or Hollywood Edge CD’s years ago and want to refresh the full length descriptions not limited to old file system limitations character length names. The full descriptions will be burnt into the files BWAV Bext chunk which is readable buy all major audio database programs. Ripping rips your SFX CDs with the full BWAV Description with additional naming options. Injecting is what makes this app different from the rest. It’s for people who ripped their CDs years ago but didn’t name them properly and now want the advantages of newly ripped files with long BWAV description fields added in. 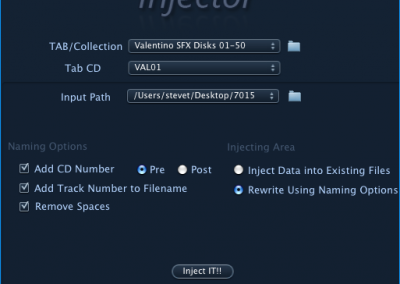 Injector will read the tracks in the selected folder (alphabetically), find the the matching description from selected TAB files and Inject the BWAV data into the file. It can also rename the file if wanted at the same time. Make sure your tracks are labelled Track 01, 02, 03 instead of Track 1, 2, 3 because in Windows XP and OSX Track 10 comes before Track 2. So put those zeros in on the first 9 tracks. Then sort by NAME to make sure they appear in the correct order before Injecting. If you add any TABs to your collection, please email them to us to add to the install to share with other users. 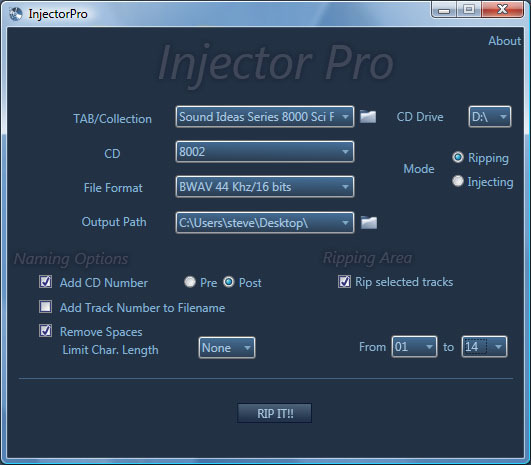 Or if you are having problems adding a file send it to us to conform it to the Injector Standard for you. Creating your own can be a bit tricky sometimes and it’s easy to lose the formatting. You can use Excel 2005 or even better I recommend importing a .tab file into browser version of Google Doc/Drive by just dragging it into your browser when the drive is shown and it will auto-convert it to a spreadsheet. Then make your edits and save it as a plain text document. It will be a .tsv file. 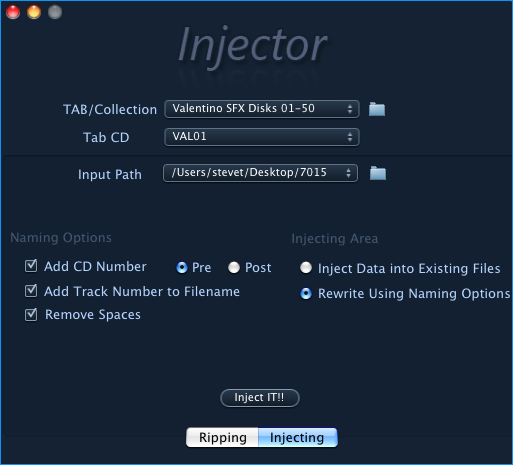 Run Injector Pro and import the new file using the Tab/Collection folder icon. Currently you can lock your license to either your Local System Drive or a CodeMeter CmStick for both PC and Mac versions. If you choose the CmStick option we write Two Licenses on each dongle so you can run 2 copies at one time, so you can have 2 PC’s or Mac’s Ripping and Injecting at the same time! The files seems to be getting Injected out of order in macOS. How to fix it? The files have to be on an HFS+ partition for some reason. If they are on APFS or exFAT the results could be strange. What is the the difference between the PC and the Mac Versions? The only difference is the PC version can rip to file formats other than 44/16, but the Mac version can still Inject at higher sample and bit rates like the PC version. Yep! just like BaseHead there is no extra charge to run on both PC and Mac. CmStick users get 2 licenses for there CmStick as a bonus also. Where are the TAB files stored after I import them if I want to remove them?